Mark Reynolds insists Dundee United cannot rely on Ross County slipping up in the race for top spot. Picture: SNS. County moved five points ahead of second-top United with a game in hand thanks to Tuesday’s 2-1 triumph over Caley Thistle and took another step towards securing automatic promotion. But on-loan Aberdeen defender Reynolds – who yesterday signed a pre-contract agreement to remain at Tannadice on a permanent deal – chose to snub the televised encounter as he gears up to go head to head with the league leaders in tonight’s crunch clash in Dingwall. Robbie Neilson’s men edged past County 1-0 at Tannadice just over a fortnight ago but Reynolds believes the fight for the flag will be far from over should they chalk up back-to-back wins over them. He said: “I didn’t watch the [Inverness] game but I saw the result coming in and obviously it was disappointing from our point of view. “They lost points at Alloa on Saturday, though. And as we keep saying, this league is so competitive and teams will lose points when they’re not expected to. “All we can do it beat the teams who are put in front of us. We can’t rely on them slipping up too much, which is why this weekend is a good opportunity because it’s in our hands to take points off them. Nobody inside Tannadice is contemplating the prospect of not getting back to the Premiership this season, and 31-year-old Reynolds insists only they can deal with the huge expectations. He said: “Pressure is pressure. It’s as big as you want to make it. Dundee United are a club which belongs in the Premiership and there is pressure to get them back up. “When I was at Aberdeen we were competing under the pressure of trying to win a league, win a cup or qualify for Europe. If you’re at a big club the pressure is always there. Winger Peter Pawlett is expected to start for United after getting over a groin problem but striker Osman Sow is still struggling. Ross County’s Daniel Armstrong is out to complete the leap from League 1 to the Premiership – and knows how valuable a win tonight would be. The former Wolves and Raith Rovers winger arrived in January but has had to wait patiently for his chance to join in County’s title push. That opportunity came on Tuesday, with influential Michael Gardyne injured, when the 21-year-old impressed in their crucial victory in Inverness. With Gardynemissing tonight, Armstrong is favourite to again fill the breach. Victory would take County within two victories of the Championship title and Armstrong said: “It’s massive – if we win this the pressure is all on them. “With a victory, I think we can make it possible to win the league a few games after it so it is massive that we take care of Friday. “It would be nice just to beat them as well after the defeat down at their ground the other week. “The boys are confident. They’ve been brilliant in training and were brilliant the other night. We’re all ready for it. 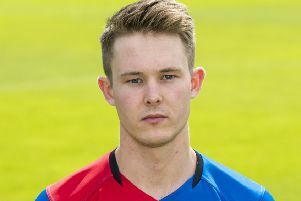 Armstrong’s derby bow was only his second start for the Staggies after the New Year move north, but County’s management team are excited by his potential. He said: “Hopefully I’ll be involved against United. It was a massive win the other night. “I’d been cup-tied for the two previous derbies, so it was great to play from the start and it was a great win. We couldn’t have bounced back from the Alloa defeat in a better way. All the boys were buzzing and I think we deserved it as well. “From a personal perspective, I’ve been waiting my chance. It has been tough since I came in because the boys have been on fire and it’s been hard to get in the team.